As “Dancing with the Stars” plays in the living room, 5-year-old Hailey Musgrove cha-chas in front of the television, following the routines on screen. She loves dancing but hates dressing up. Her ballet costumes are scratchy and uncomfortable, so she fashions a dress made of blankets draped around her waist. Dancing on the hardwood floor, she would fall often, and she had some near-misses with the TV, nearly knocking it over multiple times. She watched nearly every episode of the reality show and would often tell her mother, Drucilla, about her growing love for dance. Her mother remembers how Musgrove would also watch children’s musicals on television. At 4, she started taking ballet classes, but a bad experience with her instructor made her stop dancing by age 7. “She was horrible and mean and would make all of the students cry at the end of class,” Musgrove said. After dancing, she tried her hand at gymnastics, then rock climbing, karate, fencing, musical theater, track and cross country. By her teenage years, Musgrove found it hard to settle on one thing in her life. Musgrove was homeschooled throughout grade school. She came to Eastfield in 2015 without any concrete plans. Three years later, Musgrove now takes 21 credit hours in her final semester, trains and competes at the Academy of Dance, Music & Theatre in Greenville, volunteers to teach young dancers and helps on the family farm. She plans to transfer to Texas Woman’s University to major in kinesiology and become a licensed physical therapist. She hopes to use dance in her physical therapy. With dance back in her life, she has set plans she didn’t have before. 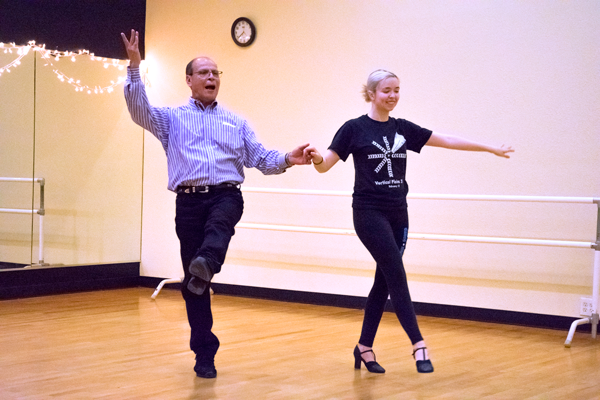 Although her dance instructor, Tom Ramon, said now she’s established herself as one of the best competitive ballroom dancers at the studio, Musgrove needed a jump start before reverting back to dance. During her cross country phase, Musgrove ran through the winding backroads of Greenville, jogging down rocky, unpaved roads. She started a training routine for herself. One day, 1 mile. The next, 3 miles. After that, 5 miles. Then back to 1 and so on. She was going through her usual routine on the familiar roads in late spring 2014. Suddenly, her left foot landed in a pothole. The pain jolted through her leg. She pushed past the pain, barely able to walk. Fueled by adrenaline, she limped home, not stopping or else the pain would return. An X-ray revealed she had broken the ankle and two of her toes. Friend Katrina Heidel invited her to Landon Winery in Greenville for a social dance. She agreed to go, even though her ankle still hadn’t fully healed. It had been a mere four weeks since the injury when she decided to take off her boot and put on dance heels to take part in the dances. It was here where she met Ramon, who had been dancing at the venue for many years. Four months later, in early fall, she was dancing with Ramon at the Academy of Dance, Music & Theatre. In her first lesson, she repeatedly stepped on Ramon’s feet, something he had grown used to from novice dancers. During a routine, she almost made him fall, too. Before long, Musgrove became hooked on dancing again. She has learned to dance ballroom — waltz, tango, cha cha, swing, bolero and many others. Ramon said her growth in those first few months was remarkable. She proved to be a natural at ballroom dancing, while also learning pointe, ballet, jazz and tap. Drucilla Musgrove said that her daughter’s upbringing shaped who she is today, crediting her own stubbornness and her father’s work ethic for her daughter’s determination to excel. Musgrove and Ramon are now partners as a pro-am couple — one professional and one amateur dancer. During practices, he guides her with his right hand as the pair move to the rhythm of tango, rumba, cha-cha, foxtrot, salsa and swing dances. Rather than moving in unison, she reacts to the male lead, gliding effortlessly through each step and covering up any mistakes so the untrained eye won’t notice. By November of that year, Musgrove was competing at her first competition at the Tulsa Dance Invitational. She placed first in each event she competed in. But she does. And at the following year’s contest, she did it again. When she isn’t competing, Musgrove volunteers at the studio, teaching beginner level classes to young girls, guiding them through the most basic steps. She extends the knowledge from her trainings with Ramon to her pupils. Musgrove lines up the girls along the ballet barre on the wall, using it to help them keep their balance while practicing foot shuffles and taps. Three of the four girls in her class sit down with their legs out in front of them in the middle of the rectangular ballroom, with each taking turns to perform a jeté — a leaping jump from one foot to the other. Despite her busy schedule, Musgrove makes time for social dancing with friends and helping out on the family farm, where the Musgroves grow mushrooms and lavender to sell to restaurants and grocery stores. And now, she said, she finally feels complete. “I was pretty chaotic when I started ballroom dancing, but it centered me,” she said, alluding to her struggles of not knowing what she would do while growing up. “It gave me not only peace but a place where I could work through all my problems. Ramon said in his 35 years of teaching dance, Musgrove’s resilience stands out.